Vasco Nuñez de Balboa, European discoverer of the Pacific Ocean and a leading figure among the Spanish explorers and conquerors of America, was born at Jerez de los Caballeros, in Estremadura, about 1475. Though poor, he was by birth a gentleman (hidalgo). Little is known of his life until 1501, when he followed Rodrigo de Bastidas in his voyage of discovery to the western seas. He appears to have settled in Hispaniola, and took to cultivating land in the neighborhood of Salvatierra, but with no great success, as his debts soon became oppressive. In 1509 the famous Ojeda sailed from San Domingo with an expedition and founded the settlement of San Sebastian. He had left orders with Enciso, an adventurous lawyer of the town, to fit out two ships and convey provisions to the new settlement. Enciso set sail in 1510, and Balboa, whose debts made the town unpleasant to him, managed to accompany him by concealing himself, it is said, in a cask of "victuals for the voyage", which was conveyed from his farm to the ship. The expedition reached San Sebastian to find Ojeda gone and the settlement in ruins. While Enciso was undecided how to act, Balboa proposed that they should sail for Darien, on the Gulf of Uraba, where he had touched when with Bastidas. His proposal was accepted and a new town was founded, named Sta. Maria de la Antigua del Darien; but quarrels soon broke out among the adventurers, and Enciso was deposed, thrown into prison and finally sent off to Spain with Balboa's ally, the alcalde Zamudio. Being thus left in authority, Balboa began to conquer the surrounding country, and by his bravery, courtesy, kindness of heart and just dealing gained the friendship of several native chiefs. On one of these excursions he heard for the first time, from the cacique Comogre, of the ocean on the other side of the mountains and of the gold of Peru. Soon after his return to Darien he received letters from Zamudio, informing him that Enciso had complained to the king, and had obtained a sentence condemning Balboa and summoning him to Spain. In his despair at this message Vasco Nuñez resolved to attempt some great enterprise, the success of which he trusted would conciliate his sovereign. 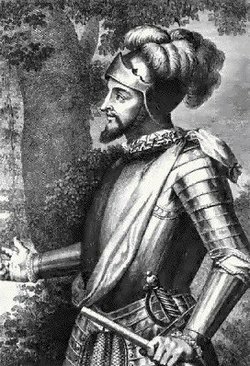 On the 1st of September 1513 he set out with one hundred and ninety Spaniards (Francisco Pizarro among them) and one thousand natives; on the 25th or 26th of September he reached the summit of the range, and sighted the Pacific. Pizarro and two others were sent on to reconnoitre; one of these scouts, Alonzo Martin, was the first European actually to embark upon the new-found ocean, in St. Michael's Gulf. On the 29th of September Balboa himself arrived upon the shore, and formally took possession of the "Great South Sea" in the name of the Spanish monarch. He remained on the coast for some time, heard again of Peru, visited the Pearl Islands, and thence returned to Darien, which he entered in triumph with a great booty on the 18th of January 1514. He at once sent messengers to Spain bearing presents, to give an account of his discoveries; and the king, Ferdinand the Catholic, partly reconciled to his daring subject, named him Adelantado of the South Sea, or admiral of the Pacific, and governor of Panama and Coyba. None the less an expedition sailed from Spain under Don Pedro Arias de Ávila (generally called Pedrarias Dávila) to replace Balboa in the government of the Darien colony itself. Meanwhile the latter had crossed the isthmus and revisited the Pacific several (some say more than twenty) times; plans of the conquest of Peru and of the exploration of the western ocean began to shape themselves in his mind; and with a view to these projects, materials for shipbuilding were gathered together upon the Pacific coast, and two light brigantines were built, launched and armed. With these Vasco Nuñez now took possession of the Pearl Islands, and, had it not been for the weather, would have reached the coast of Peru. But his career was stopped by the jealousy of Pedrarias, who pretended that Balboa proposed to throw off his allegiance, and enticed him to Acla, near Darien, by a crafty message. As soon as he had him in his power, he threw him into prison, had him tried for treason, and forced the judge to condemn him to death. The sentence was carried into execution on the public square of Acla in 1517. From a reckless adventurer, Balboa had developed into an able general, an excellent colonial administrator, and a statesman of mature judgment and brilliant foresight.